washington boulevard | ride. travel. live. 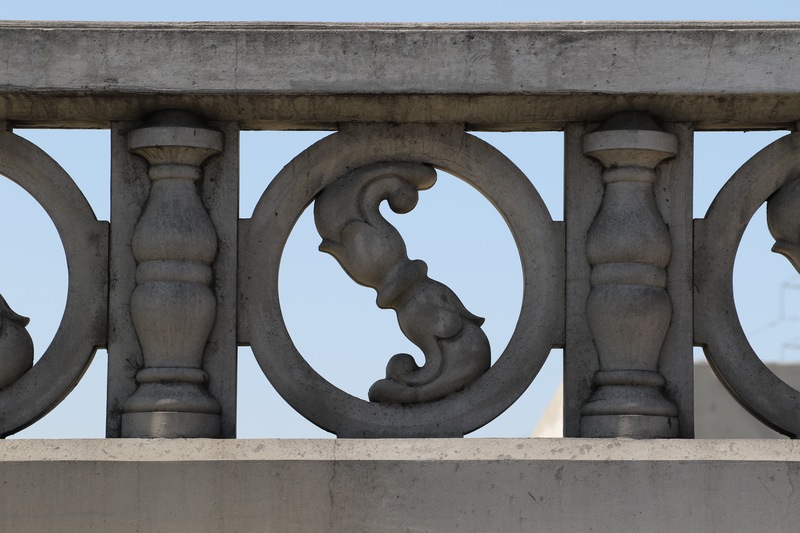 So to finish up my little tour of the LA River bridges downtown, I walked the Olympic Boulevard Viaduct, originally called the Ninth Street Viaduct (1925), and the Washington Boulevard Bridge (1931) on two separate occasions. These two bridges are located just south of the I-10, and carry a fair amount of traffic bound for the vast industrial corridor stretching from downtown to Vernon. Needless to say, like the other bridges, they’ve seen better days and have been extensively retrofitted, but are beautiful structures with lots of details to check out. The Olympic Boulevard bridge is a rather schizophrenic structure befitting its rather long length (1422′), with two distinct sets of lighting standards, colored two different ways, and a whirling, S-shaped, guardrail pattern along the sidewalk. What’s seen today is the result of a renovation and seismic upgrade in 1998. 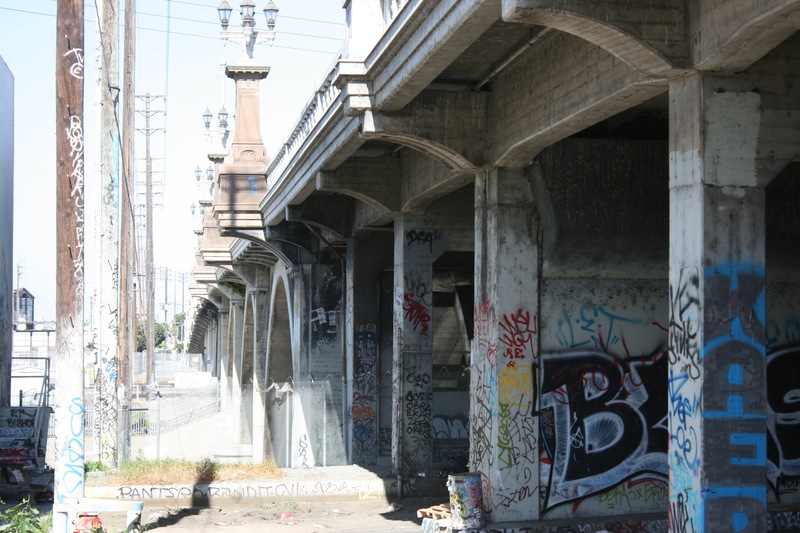 It crosses the LA River and a set of railroad tracks on the eastern side of the river. It’s been made very colorful by graffiti over the years, with the usual set of parking spaces, homeless encampments, and art canvasses in the areas underneath the bridge. And this brings us to the final bridge in this walk. The Washington Boulevard Bridge is one of the shortest, and one of the most distinctive. Despite its rather desolate location near a concrete plant, a recycling center, and essentially in the middle of nowhere, it’s an island of elegance amongst the drabness and gray. Then there are the heavy trucks and large vehicles that batter this span on a daily basis, and it’s surprising that it’s survived this long. 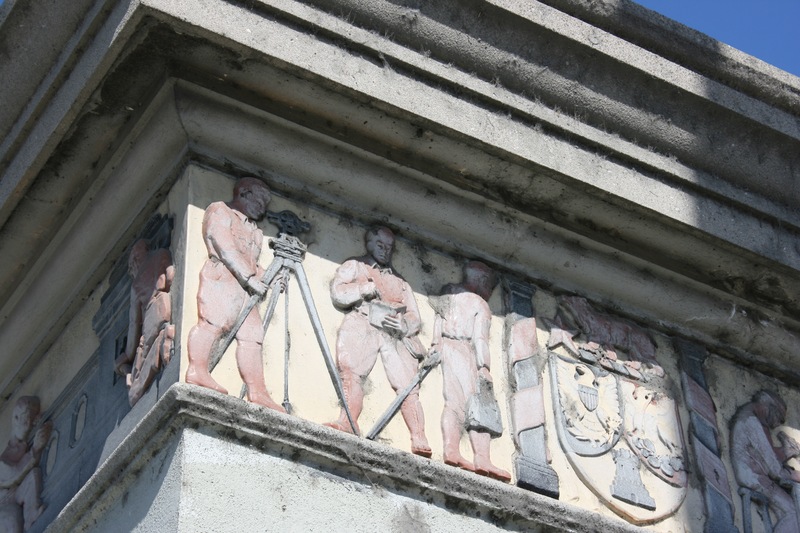 Most notable is the set of now-faded, but colorful, engineering-oriented, terra cotta friezes decorating the four large pylons on the short (312′) structure.